Is part-time shoulder use consistent with the goals and priorities identified in the Regional Plan and Congestion Management Process? What is the transportation need in the corridor? Should part-time shoulder use be considered as a reasonable alternative to meet a transportation need or as a component of an alternative? Does the region have experience with transportation system management and operation (TSM&O) implementation? Is part-time shoulder use feasible from a constructability standpoint? Is real-time monitoring and incident response in place? Does part-time shoulder use reduce cost compared to traditional projects? How can lanes designated for part-time shoulder use be designed and operated to optimize benefits and mitigate any adverse impacts? Part-time shoulder use can be a cost-effective strategy for relieving congestion and improving operations. As such, it can be an important element in the overall planning of the region’s transportation system. Although it can be less expensive than other alternatives, part- time shoulder use can represent a sizable investment, which should be considered in a planning process within the context of regional goals and objectives. Likewise, the value also needs to be weighed against the other needs and goals a region may have. During the planning process, a number of issues should be examined to determine the viability of this strategy as an alternative for addressing the needs in the region. The extent to which these issues need to be addressed as part of the regional planning process varies depending on the scope and purpose of the project being considered. In some cases, the implementation of various TSM&O options can change the dynamics of the transportation network in a region, but in others, the impacts may be more marginal and localized. As such, the amount of focus that needs to be given to each of these points should be commensurate with the scope and significance of the strategy. Regional Needs to Address Congestion, Reliability, and Safety Performance Issues. The regional planning process provides an opportunity to look at the transportation network as a whole and the performance of that network under different scenarios. It also points to the importance of having data to understand the current conditions and the future possibilities. This data provides the strongest justification for action, but also allows options to be evaluated in terms of their impact on performance. To the extent to which an objectives-driven, performance-based approach to planning for operations has been adopted, the consideration of part-time shoulder uses should also be part of the evaluation of other operational strategies that may also result in improving overall performance under multiple objectives. As an example, if data shows congestion is primarily a result of non-recurring problems, a look at other alternatives such as improved incident response in the area may be worthwhile. Likewise, the regional data can also provide a baseline for the region’s current congestion, reliability, and safety performance. In modeling future scenarios, this will also allow a basis for comparison, particularly when looking at a network level. Relationship to Other Planned Projects in the Region. A focus on a single problem (e.g., reoccurring congestion along a particular highway) may not provide a complete view of either the consequences of a particular action or the opportunities to leverage other planned projects. Such challenges and opportunities may include improvements such as interchange reconstruction, repaving projects, or new transit facilities in the area. In Transportation Management Areas, MPOs are required to maintain a Congestion Management Process (CMP), and this will coordinate potential projects, such as part-time shoulder use, with other planned projects. Likewise, if the region has developed a coordinated plan of TSM&O strategies, there may be an opportunity to connect those systems or at least coordinate their operation as part of a broader Active Traffic Management (ATM) or Integrated Corridor Management (ICM) system approach. Another scenario relates to the staging of projects and the use of TSM&O strategies, such as part-time shoulder use, in the CMP as an interim solution while a longer-term solution is being developed. Because the long-term solution may include large capital improvements, the interrelationship between the TSM&O improvement and the ultimate project should be considered beforehand to avoid future conflicts. As an example, will implementation of the TSM&O strategy actually reduce the support needed for the long- term project? Support of Other Regional Goals. Other communities have incorporated similar elements into their planning processes, looking beyond what has traditionally been limited to transportation performance considerations. Some communities also incorporate conditions associated with natural or manmade disasters, such as evacuation, into their transportation planning. Maturity of TSM&O in the Region. Early in the planning process, it is important to consider what the region’s current TSM&O capabilities are and if they could be applied to the implementation of a part-time shoulder uses project. The Federal Highway Administration (FHWA) and the SHRP2 program have looked closely at the issue of “maturity” as it relates to the skills and experience that are needed to implement major TSM&O strategies, and they have developed “Capability Maturity Models” to describe the critical knowledge, skills, and abilities needed to make those deployments successful. Reaching the full potential of TSM&O is not primarily an issue of “technology” or best operations practices. Rather, the key is to put in place and manage specific supportive business and technical processes and supporting institutional arrangements—in essence, to “mainstream operations” into the institutional framework of the transportation agency. Business processes— Formal scoping, planning and programming, and budgeting (resources). Systems and technology— Using systems engineering, systems architectures, standards (and standardization), and interoperability. Performance— Defining measures, data acquisition and analytics, and utilization. Culture— Technical understanding, leadership, outreach, and program legal authority. Organization and staffing— Programmatic status, organizational structure, staff development, recruitment and retention. Collaboration— Relationships and partnering among levels of government and with public safety agencies, local governments, MPOs, and the private sector. The implementation of part-time shoulder use can be challenging given the need for specialized skills and coordination across multiple disciplines and organizations. As such, an organization that is contemplating part-time shoulder use needs to first confirm it has developed TSM&O skills and has the experience to apply them to this kind of undertaking. In addition to the organization’s own maturity, basic elements of an operational infrastructure should also be in place before part-time shoulder use, particularly more- complex part-time shoulder use such as dynamic part-time shoulder use, is implemented. The infrastructure to conduct traffic surveillance and monitoring, as well as rapid incidence response are logical precursors to any temporary lane use strategy. These early TSM&O strategies will also provide decision makers with much better information regarding the performance issues on the system. The planning process provides the first opportunity to consider the viability of part-time shoulder uses as a means to respond to the region’s goals. As part of a performance-based planning process, relevant performance objectives are identified to define the basic “yardstick” the region wants to use in evaluating their capital programs and TSM&O strategies. If this process confirms that part-time shoulder use is a viable option, then the next question needs to focus on the feasibility of designing a facility to achieve or contribute to those performance objectives. Planning for operations is “a joint effort between planners and operators to integrate management and operations strategies into the transportation planning process for the purpose of improving regional transportation system efficiency, reliability, and options”. (9) In the context of part-time shoulder use, a planning for operations process incorporates part-time shoulder use into the planning process as a tool for improving operations, similar to widening a road or constructing a new road. Static and dynamic part-time shoulder use should be broadly considered as congestion management strategies for freeways, and bus-on-shoulder (BOS) should be broadly considered as a bus reliability strategy. Incorporating part-time shoulder use into the planning process increases the likelihood of reasonable consideration under NEPA to meet a defined transportation need and ultimately implementing it. To the fullest extent possible, all environmental investigations, reviews, and consultations be coordinated as a single process, and compliance with all applicable environmental requirements be reflected in the environmental document required by this regulation. Alternative courses of action be evaluated and decisions be made in the best overall public interest based upon a balanced consideration of the need for safe and efficient transportation; of the social, economic, and environmental impacts of the proposed transportation improvement; and of national, state, and local environmental protection goals. Public involvement and a systematic interdisciplinary approach are essential parts of the development process for proposed actions. Measures necessary to mitigate adverse impacts are incorporated into the action. The types of NEPA processing options are shown in Figure 9. Part-time shoulder use often meets the criteria for a categorical exclusion (CE) because it is typically implemented within the existing ROW and largely within the existing paved surface. BOS projects and shorter static and dynamic part-time shoulder use projects that relieve acute bottlenecks are most likely to be a CE because of the relatively small effect they have on environmental resources, including social resources such as local or regional travel patterns. Larger projects that add part-time shoulder use over many miles and through multiple interchanges may have greater environmental impacts, possibly including social, traffic-related impacts, and may not be Ces. A review of the state’s Stewardship and Oversight agreement should be evaluated to determine the most appropriate NEPA approval action. Most part-time shoulder use projects have been implemented within the existing paved area of a road. Some, however, have involved widening the paved area of the roadway because the shoulder was not wide enough for a part-time lane. If the pavement is not widened, then some environmental effects related to traffic volume may be similar to that of a traditional widening improvement along an existing roadway alignment, and others will be lesser or non-existent. Effects on the environment associated with traffic volume—specifically the effects on air quality, greenhouse gas emissions, and noise—may need to be analyzed, and Chapter 5 describes how this should be done. In general, the analyses of impacts related to traffic volumes, such as air quality and noise analyses, would be similar to analyses conducted for a project that adds a travel lane. Part-time shoulder use would potentially increase peak-hour volumes and thus vehicle-miles traveled (VMT) and would affect average speeds and delays along the corridor. The environmental analysis will also need to reflect the specific type of part-time shoulder use being considered within its context of the larger roadway system and adjacent land uses. Depending upon the type of part-time shoulder use, as well as other treatments or strategies, such as the use of variable speed limits, the effects can vary. Many other environmental categories, such as water quality, plants, animals, and cultural resources, are unlikely to be affected if the pavement is not widened and are unlikely to require analysis. However, if the pavement is widened, a part-time shoulder-use project becomes more similar to a conventional widening project, and a much broader set of environmental categories should be assessed. A recent part-time shoulder use project on I-495 in Virginia involved widening the roadway by 4 feet. A summary of the analysis conducted for this project—which ultimately resulted in a CE—is presented below. It should be noted that no two projects or project settings are the same, and impacts from part-time shoulder use will vary accordingly. Section 4(f) and 6(f) — 4(f) properties are adjacent to the project but there will be no transportation “use” of them. Cultural resources — A Section 106 effect determination of No Effect found the project as defined will not impact historical properties. Natural resources — No impacts to Waters of the US are anticipated. Agricultural/open space - No impacts because the project is in the existing ROW of the Interstate Highway System and no easements are present. Adjacent land is developed and residential. Farmland — No impacts because the project is in the existing ROW of the Interstate Highway System and adjacent land is primarily residential. Invasive species — Invasive species are likely present and soil disruption should be minimized to limit their spread. The project is incorporated in the MPO’s air quality conforming TIP and MTP. A traffic study determined the project will have no impact on traffic volumes or vehicle mix. The project is in a PM 2.5 non-attainment area, but is exempt because it is not expected to have a significant increase in the number of diesel vehicles because it is primarily providing capacity downstream of express toll lanes limited to 2-axle vehicles. Mobile source air toxins — None due to the forecast of no impact on traffic volumes or vehicle mix. Noise — A noise study was required and completed. Noise barriers were found to be feasible not reasonable. ROW and relocations — No temporary or permanent property acquired. The physical widening of the shoulder was done within existing right-of-way. Cumulative and indirect impacts — None. Public involvement — One public information meeting was held, and the CE was made available for public review and comment. Does the paved shoulder width meet agency minimum widths for carrying traffic? Would a lower speed limit or prohibiting trucks solve the problem? Do bridges over the shoulder meet agency minimum clearance height requirements? Is a special height restriction on shoulder lane users acceptable? Does the shoulder pavement cross-section meet agency minimum depths for carrying traffic? Is prohibiting heavy vehicles from using the part-time shoulder use an option? Can the equivalent annual axle load be limited (for example, allowing only relatively infrequent heavy vehicle use of the shoulder, such as scheduled local buses)? Is the drainage compatible with driving on the shoulder? Are additional inlets or other drainage modifications needed to manage hydraulic spread and remove standing water from the shoulder? Does the current drainage use a superelevation rate on the shoulder that will not support vehicle travel? Is the segment long enough? Is there a long enough segment to provide meaningful congestion relief? If short, is the segment addressing an acute bottleneck? Can safety concerns be resolved? Can ramp merge visibility and merging distance issues be resolved? Can substandard geometry be mitigated through lower speeds, vehicle restrictions, or ATM? Can the concerns of emergency responders and maintenance personnel be resolved? 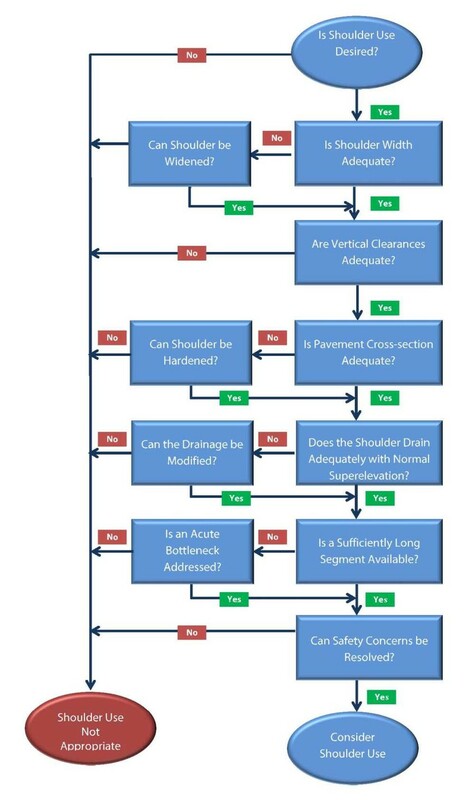 If assessment of a given facility with the decision tree in Figure 10 determines part-time shoulder use is generally feasible, then the checklist shown in Table 1 can be completed to determine specific type(s) of feasible part-time shoulder use. 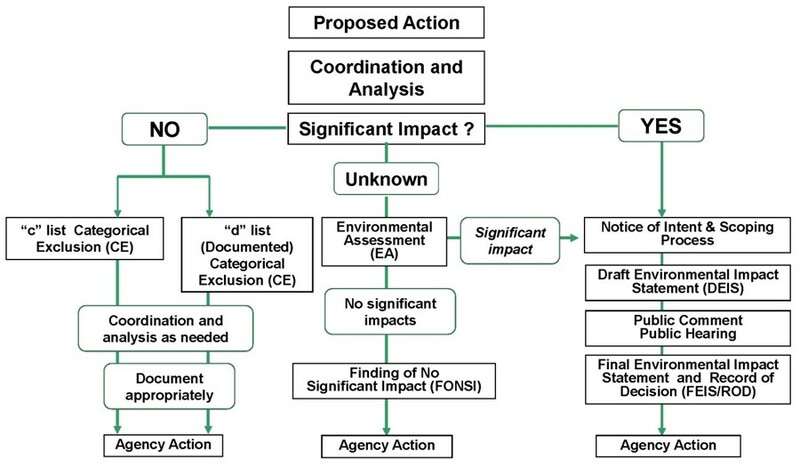 Information gathered during the assessment of the decision tree can be used to complete the feasibility checklist. For example, a region’s transportation goals may dictate whether the shoulder is open to buses, HOVs, or all vehicles except trucks, and pavement conditions and vertical clearances may dictate whether trucks are permitted to use the shoulder. HOT = High occupancy and toll paying vehicles. Note to User: please check off all usage options that are feasible (under the operating agency’s design and operations policies) and note whether a lower posted speed limit for part-time shoulder uses might affect that assessment. Provide comments to document rationale for assessment. A key element of Table 1 is the option of using the left shoulder or right shoulder. Unless there is an opportunity to remark all lanes on the freeway—such as after a resurfacing project—the choice of which shoulder to use may be determined based on a review of the existing shoulder width. Table 2 presents advantages and disadvantages of left and right shoulder lanes. Currently, the majority of U.S. part-time shoulder use facilities utilize the right side. Left shoulder not used as much for emergency stops or law enforcement stops. Least expensive if width is available. Further from most large shoulder vehicles — trucks often restricted from left lane. No conflicts with ramps (unless left exits/entrances present). Potential sight distance enforcement stops. problems with some median treatments. Less likely to provide a 12 foot shoulder. Often the easiest to implement because right shoulders are generally wider than left shoulders. More likely to have large challenges at merge and adjacent areas for turnouts. Right shoulder is preferred area for emergency stops and enforcement. Conflicts and sight distance challenges at merge and diverge areas of ramps. PBPD is consistent with FHWA’s objectives-driven, performance-based approach to planning for operations FHWA has provided substantial guidance including, Advancing Metropolitan Planning for Operations: The Building Blocks of a Model Transportation Plan Incorporating Operations — A Desk Reference”. (15) This Desk Reference offers a process for, as well as examples of, objectives-driven, performance-based approaches, and includes information related to part-time shoulder use. The Desk Reference details the ways in which TSM&O strategies, including part-time shoulder use, can be integrated into the planning process. PBPD focuses on performance improvements that benefit both project and system needs. Agencies make sound decisions based upon performance analysis. By scrutinizing each element of a project’s scope relative to value, need, and urgency, a PBPD approach seeks a greater return on infrastructure investments. PBPD strengthens the emphasis on planning-level corridor or system performance needs and objectives when planning, scoping, and developing individual projects. PBPD can be implemented within the Federal-aid Highway Program regulatory environment utilizing existing flexibility. PBPD does not eliminate, modify, or compromise existing design standards or regulatory requirements. State department of transportation (DOT) executives embrace PBPD and communicate this support to all state employees and consultants. State DOT PBPD champion leads implementation throughout all levels of the agency. Agencies revise policies and guidance as appropriate to include the values of PBPD, thus securing a multi-disciplinary and comprehensive approach to delivering projects under PBPD. Agencies encourage and empower engineers to exercise judgments on projects based on PBPD principles. FHWA Division Offices support state DOTs in their implementation with early and close coordination. PBPD should consider multiple design and operating solutions, including part-time shoulder use, to find the combination that best addresses the project objectives. It is also useful for arriving at the best design and operation concept for part-time shoulder use. Part-time shoulder use is just one of many possible TSM&O treatments for cost-effectively improving the operation and reliability of a facility. Although it may be tempting to immediately assume that part-time shoulder use is “the solution,” looking deeper may reveal issues that were not originally anticipated or other alternatives that may better fit the circumstances. There are several design/operating concepts for part-time shoulder use. The decision to pursue the design of part-time shoulder use and the selection of the appropriate design/operating concept should be made as part of a comprehensive Performance-Based Practical Design (PBPD) assessment of design and TSM&O options. The assessment may be informed by systems engineering processes, with the ultimate goal of achieving the agency’s performance objectives for the facility design and operations. Transportation decision-making typically occurs through a NEPA process and identifies a solution to an identified problem. Although part-time shoulder use can make sense in some situations, it can also have unintended consequences. Solving a problem at one location may create other problems in the future, or it may simply result in maintaining the status quo. A piecemeal approach may result in a suboptimal allocation of resources, as well as lost opportunities to do more. A performance-based approach to decision-making focuses not on the problem, but rather on the desired outcome. “Performance” is the ultimate objective measure of the system’s ability to satisfy or exceed user needs and expectations, particularly relating to congestion, reliability and safety. Understanding the factors affecting performance, and measuring those, allows decision makers to look beyond short-term solutions and take a longer-range view of system performance. By establishing performance objectives, a clear message is not only established in the planning and prioritization of projects, but those same performance objectives can guide the design and operations decisions further into the process. An agency should work with its internal and external stakeholders to identify the performance objectives and constraints for the facility they are evaluating for possible part-time shoulder use. Table 3 presents potential performance objectives for a PBPD analysis. Reduce percent of peak period corridor trips below 45 mph to <30%. 10. Lane-hours closed for maintenance. Many of the objectives in Table 1 could be achieved with conventional widening or part-time shoulder use on a given facility. However, on many freeways, conventional widening may not be viable due to expected impacts identified in the NEPA process or fiscal considerations. Part-time shoulder use is most viable in comparison to conventional widening in constrained situations. Part-time shoulder use is not the only means for addressing recurring congestion, and part-time shoulder use often works more effectively when it is combined with other TSM&O strategies. The Congestion Management Process (CMP) and subsequent preliminary engineering activities can identify and refine which TSM&O strategies are appropriate and practical to implement in combination with part-time shoulder use on a given facility. Table 4 lists TSM&O strategies that can support part-time shoulder use. The application of control devices, such as traffic signals, signing, and gates to regulate the number of vehicles entering or leaving the freeway, or to smooth out the rate at which vehicles enter and exit the freeway. Potential mitigation for heavy merge volumes from a ramp into the shoulder. The systematic, planned, and coordinated use of human, institutional, electrical, mechanical, and technical resources to reduce the duration and impact of incidents, and improve the safety of motorists, crash victims, and incident responders. Strategies to notify drivers of incidents and clear them quicker can mitigate the loss of a shoulder refuge for disabled vehicles. Highway facilities or a set of lanes where operational strategies are proactively implemented and actively managed to optimize traffic flow and vehicular and person throughput. These strategies typically involve pricing, vehicle eligibility, and access control (e.g. HOV, HOT, BOS). Managed lanes and lanes designated for part-time shoulder use can be added at the same time to maintain the existing number of general purpose lanes. The shoulder may already need to be restricted to certain types of vehicles due to its width and other physical conditions. A comprehensive collection of strategies to dynamically manage recurrent and non- recurrent congestion on the mainline based on prevailing and predicted traffic conditions. ATM includes the automation of dynamic deployment to optimize performance quickly and without delay that occurs when operators must deploy operational strategies manually. These include: dynamic speed limits, dynamic lane assignment, junction control, queue warning, among others. Adjusting speeds and lane assignments to prevailing conditions and notifying drivers of congestion or other incidents can mitigate speed differentials, substandard geometry, and the loss of a shoulder breakdown lane. A combination of strategies for enabling better traveler decision making throughout the trip chain — before, during, and near the end of a trip. Includes: 511, apps on Smartphones and tablet devices, CMS. Traveler information educates drivers on when shoulder is open and closed. A set of strategies tailored to the unique needs of commercial vehicle operation to promote efficient, seamless, and secure freight flows on the U.S. transportation system and across our borders. Information makes truck drivers aware of shoulder lane status and whether or not they may use the shoulder.